Learn how to develop native English pronunciation through grammar mastery in episode 6 of the Power Learning Podcast! In Episode 6, we finish month 3 of the fluency journey of our Master English Conversation Scholarship Contest winners and discuss developing native English pronunciation through grammar mastery. You’ll also learn why having excellent grammar is far more important than having great pronunciation. Hello and welcome to Episode 6 of the EnglishAnyone.com Power Learning Podcast. Well, it’s been a long time since I’ve spoken with you last. It’s been about a month. I’ve been incredibly busy, releasing the new Master English Conversation Version 2.0. I’m really excited and the new subscribers we have are really enjoying the program. And it’s, uh, it’s really amazing, actually, to create something completely new and different. 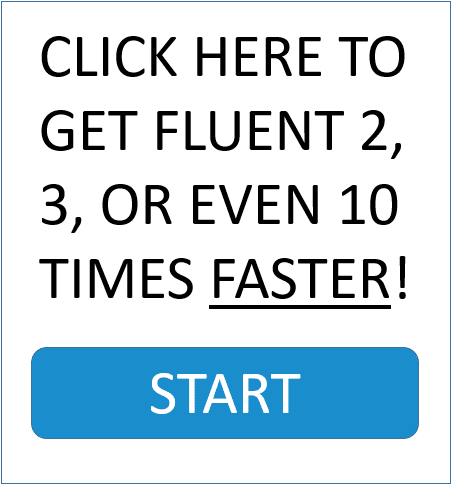 Uh, and it’s a fantastic program if you’re looking for a really fast way to learn English conversation using video. So whether you are learning English for your work or even if you are retired and you just enjoy studying English, Master English Conversation Version 2.0 is a really fantastic way to learn because it really helps you see the language much more clearly. It’s also much more memorable than just listening to things. So even though right now, you get to listen to my beautiful voice, if you really want to become a fantastic English speaker, I highly recommend you try Master English Conversation Version 2.0. Well, it’s great to be back again for another episode of the Power Learning Podcast and, uh, it’s especially good timing right now because I can introduce the audio recordings that our four winners of the Master English Conversation Scholarship, uh, I can have them introduce themselves and you can see what their practice has been like after three months in the program. So I’m really excited for you to listen to their progress. And it’s amazing all of the, the little things, especially, uh, that I notice, as a native English speaker, the way they pause and the way they speak and the words that they use, they’re using more native language and speaking with much more confidence. And it’s really great to see that the program is helping so many different kinds of people and, especially our four winners here. And truth be told, all you really need to do is get out and practice. There’s no magic bullet. There’s no special thing that you really need to do in order to get fluent. It’s just the people that are able to continue, the people that keep going and make little progress each month, those are the people that really get fluent faster. So I think this really demonstrates, with, uh, great tools and a great teacher, as long as the students are really making an effort, then they can go out and do amazing things. So I will turn it over to them. I will let them introduce themselves and they will continue explaining things this month and tell you what they did. Uh, we had some interesting times in the Master class lesson, uh, the Master class video lesson and also for the Special Mission Homework Assignment for the past month. So right now, they are now starting Master English Conversation 2.0 and you will hear about their experiences beginning with that program next month. Well, I’ll let them introduce themselves and tell you about what’s going on and then I’ll come back again and I’ll tell you about what you can do and also what they can do to continue practicing and continue to get fluent faster with the program. Enjoy. Yen:	Hi. My name is Yen. I’m a student of Master English Conversation. This month’s lesson reminds me of lots of things about when I was younger. I remember when I was in secondary school, in Grade 6 or 7, I was passionate about Hannah Montana. I really like her movies and her songs, especially the song, Nobody’s Perfect, although at the, at that time, I did not understand what the song written about. But I was really like this melody. And now I go to YouTube and watch that movie and listen to that song, I feel my English has improved a lot, I can understand most of what they say in the film, though not fully understand, but I think I was able to understand about 70%. It’s more difficult to listen to the song because it’s very fast, but at least I can understand what it’s written about. I’m continuing to watch that film and I think this will help me improve my English much faster. I was thinking a lot about your trickiest challenge. Actually, I’m a very shy girl. I was all the way worried about people laughing at me so it is very hard for me to do some weird ridiculous things. But in this, I tried to do one thing. I have changed my hairstyle. I had my hair curled and it looks not very bad. That morning, you know, the first day I went to school with the new hairstyle, when I came into my class, all of my friends suddenly shriek and they come to see my hair. Because no one in my class had curly hair, everybody was very excited about my new style. Someone said that my hair is very great. It makes me look more pretty. Somebody said that I look like a doll. And I was really happy with all of those compliments. But there are also those who said that I look older and something like that. But I think this hairstyle suits me and I like it. I know this is not really the funny embarrassing things you want me to do, but I think if somebody helped me build my confidence, I’ll try to do more things later. Okay. That’s it. Thank you for listening. Good bye. Bhaskar:	Hey, friends. How are you doing? I hope you are doing great. My practice is really going wonderful and I’m always thankful to Drew for providing me this awesome course. This month’s lesson set is all about kids. And as usual, I learned pretty much things from it, including vocabulary, phrases, grammar points and, additionally, confidence-building techniques. I really enjoyed, uh, the talks between Drew and his mom, remembering the things when Drew was very young. And a small talk between Drew and Shannon’s kids. And they’re cute. I’m happy to say that, uh, I learned from these lessons, really good things. For this month’s Special Mission Homework Assignment, Drew gave us for things to do. They’re really wonderful tapes. The first three that I had to do with English, but the fourth, uh, task is about developing your confidence. And, uh, it also has some philosophical flavor in it. The first task is to watch a movie that we watched when we were young or when we started, uh, learning English. It’s just because to see how it feels when we are watching a movie that we watched, uh, when we didn’t know much about the language. From this thing, actually, then isn’t much more ways that I watched when I was a kid, but, uh, as far as I remember, I watched one movie. That’s Jurassic Park, when I was in high school. I think the class teacher took us, uh, to that movie. And actually, I didn’t understand anything on that movie from English. And what I understood in that movie was just from the gestures and from the sounds. Since I started learning English for, uh, two years, I watched this movie on Sony PIX a couple times. So I didn’t choose this movie for this month’s task. But there was a movie that I watched when I started my English practice that wasn’t that long ago. I think almost two years back. And the title of that movie is A Better Life. So I decided to watch that movie for this task. I watched after two years later. And I watched that movie this week again and I got almost complete understanding of that movie, except the Spanish conversations. And I got some wet in my eyes at one scene when the son met his parent in jail before his deportation to Mexico. Really, a feel-good movie. I think it was nominated to Academy Awards also, really a nice movie. It’s a story between a single parent and his son in an immigration theme. The second thing of this assignment is to ask simple questions, like kids. You know, kids are really cutest about everything and they often ask their parents and the people around them a lot of questions. And, uh, that’s the way they learn along ways and other things. I frequently do this thing. Whenever I have a new contact on my Skype, I tend to ask a lot of, uh, simple questions in order to know about them and their country. If they are not interested, I will give it up, but if they are positive, I continue it and ask them a lot. Recently, there’s a new person in my contacts list and, uh, she’s from Thailand. And I asked her a lot of questions about, uh, the king of their country, the political system there and, uh, about the film production in their country. And the things about their movies and the top stars in their country. I got really interested, interesting information from her. The third task was really a good tape and it’s, uh, kind of training to brain. And for this task, we need to change the sentence structure in different tenses. Whenever we come across some English, some English, whether it’s from our lang, listening or just to, from a news article, just try to [inaudible 10:27] sentence structure in as many as possible tenses. It will take some time in the beginning, but if you had, if you practice this, uh, really in a good way, our brain will understand these structures and, uh, it will give you good output automatically. This whole week, every day, I allotted at least 15 minutes’ time to do this task. I took a few short stories from Internet and I tried to make them in different tenses, like, uh, Time Traveling lesson. The final task for this month’s assignment, uh, has nothing to do with English, but, uh, to build our confidence. If we wear something new or put on some goggles, we worry a lot on how we look on these. Are we good on these? Do they fit well like that? And with that feeling, you’re actually giving others a chance to take advantage on our feelings and on our emotions. But, uh, if we are confident with the, uh, things, then we’re able to deal, uh, with the comments of others. And when we take their comments in an easy way, the comments will less and less, day by day. But the confidence is the main thing. If you are confident, even though they commented on us, those never touch our inner feelings. So Drew gave us this task and, uh, for this task, I decided to wear a lungi. It’s a traditional garment in our country that we wear it around our waist. It’s not unusual. It’s a traditional thing in our country. Many people will wear it, but, uh, I never tried until recently. This week, I wore it and I walked around in my neighborhood. I was skinny before so I thought it did, it didn’t look good on me. So I avoided it. But, uh, as I recently put on some weight, I dared to wear it and go to wearing this thing. When we have positing, positive feelings, we are being confident. That’s pretty much it. Thank you, guys. Bye-bye. Jaroslava:	Hi. This month, I have change of my mind. What happened? I sent a common mail to 20 friends of mine from college. They are very educated people. One girl said to me, “You know, you have a grammatical mistake.” I replied, “It’s no big deal. It’s okay.” So I honestly, uh, I don’t worry about grammar mistake in my language when I speak and write with friend of mine. Why I worries too much about grammar mistake in English? I don’t want to be an English TV announcer. I just want to sound, uh, natively native English speaker, your slang and your English expressions and speak grammatically correct English without hesitation and don’t worries about mistakes. I am really enjoy that Master English Conversation teaches me the skills. The first thing, uh, from special homework, I listen a song from ABBA. When I was younger, I enjoyed these songs, uh, but I don’t understand. Now, I understand, uh, much more. The second thing I use Facebook and YouTube for conversation with native speakers. I ask, uh, several questions about cooking and knitting. I read, uh, recent posts by others. I will be a better English speaker and better cook. It’s fantastic, isn’t it? I made onion soup and double-layered chocolate cake from scratch by English recipe. I like knitting. I am listening to Drew’s lessons and knitting sweatshirt or socks by English pattern. The first thing, I was, uh, wearing my son’s, Martin’s, military clothing. Um, I put on, uh, military trousers, T-shirt, cap and, uh, went to school for my other son, Mike. Women don’t usually wear army clothes and go for a walk. Every little boys like me. I got Mike to go shopping by giving him a chocolate. Then we took a bath. When I saw some acquaintances, I gave them a smile and then they gave me a smile too. When I was younger, I worries, uh, about embarrassing situation. I was very shy. During my life, I think, uh, there are a ton of embarrassing stories of my life, uh, but I don’t tell you about them. Now, I have much more confidence and one more embarrassing situation, it’s okay. What doesn’t kill you, makes you stronger. If you want to speak English, don’t be afraid to fall. Be afraid not to try. Carlos:	Hey, guys. I’m Carlos. Again, I’m here in my room, recording this audio for EnglishAnyone.com because this month has been really good for me because I actually, eh, liked this month because we were, eh, talking about kids. And this month has been really good for me because I was enjoying the, mainly the Master English Conversation because Drew was with his, uh, kind of, uh, nephew and, and niece, I must say. Well, they are not, they’re relatives, but they are like, they’re relative of him. But anyways, I liked to talk about my, the things I’ve learned this month. It’s kind of funny because I was thinking about kids, actually, because they, they don’t, they don’t think about, uh, what people say or what people do. They just, they just do it, as, as Drew said. Well, this month, I have learned about, uh, most, mostly about vocabulary and some phrases, uh, that Americans, uh, do. Uh, Americans, yeah, speak and, ah, you know, normal speech or talk. Yeah, there, there are many words that I didn’t know, of course, uh, about Drew’s mother. She is a really a good – his, her voice is like Drew’s sisters. And I think is, uh, the most important thing I learned this month was vocabulary about, uh, other things, like even more about traveling lesson, about make your sentences is in a different tenses, like in past tense, in present tense, in future tense in order to master your fluency because that is very important. Um, I was watching, uh, a movie that it was old for me. I haven’t seen, seen it in English before. It is, eh, Fight Club with, uh, Edward Norton and Brad Pitt. It is a good movie. It is about – well, it’s another story, but it was good to, to, to see it in English with no subtitles, eh, because it’s a way to learn better. And I was, uh, one day of this, I was in a mall, uh, near my job. I was asking not many people but a few, uh, that are look like Americans. And they ask me, they answer me. I was chuffed because I never done that before. Um, but it was kind of, uh, a good experience for me. It was good because you expect, uh, to, uh, well, you imagine many things that never happen, never happen. Uh, actually, people is very kind. If you ask properly, if you are respectful with them, they answer you in a good way. Well, I was, I was asking people and they were, they were [inaudible 22:19]. They were lovely. Well, the last thing, eh, was I, I did for Master, for the homework assignment. Well, I don’t have, uh, a rare or strange clothes, uh, but actually I was in this, uh, in the same day, with a friend of mine in, in this mall and I just, uh, take off my shoes and I were, and I was barefoot in the mall and it was kind of strange for me. I was with a friend of mine, but it was strange for me. There are people who were, uh, looking at me and it was weird because you don’t [inaudible 23:03]. I was not, uh, used to it, eh, well, be barefoot in a mall, well, for me was, uh, kind of, uh, I was uncomfortable, you know. But [inaudible 23:20], after that, we were like, uh, uh, getting the idea that it wasn’t that bad. It wasn’t that strange for me and I, but it was just a cup of, a couple of minutes and after that, we just finished the activity and we went back to [inaudible 23:42] and it was good. It was good because you don’t really feel that nervous after a couple of minutes, but it was, was good in order to build my, my confidence and that’s, that’s, eh, all I have to say this time. And thanks for listening. Uh, ’til next time, bye-bye. Well, I hope you really enjoyed listening to the four winners. I’m really, really proud of them. Each month, they continue to inspire me to do more and to try new things and to help other people get fluent faster. But it really shows that if you even just practice a little bit every day, you can really see some great progress in your English. And more importantly, you can build a lot of confidence in the, uh, the way that you speak and, actually, not just for speaking English, but also to be able to go out and do many other things in your life. So, at EnglishAnyone.com, or for myself even, I don’t want you to just learn English as it’s, you know, maybe a hobby or something like that. I really want you to learn English and see that maybe something that’s a language, which a lot of people think is very difficult or maybe it’s too much trouble to learn, if I can help you learn that more quickly, then you can see that, wow, it’s really much easy – it’s kind of easier than I thought it would be to learn the language. And if I can learn English, which is a pretty difficult thing to do, what else can I do? And I want you to really be thinking about these things, as you improve your English. So it’s not just about learning a language. It’s about learning a set of skills. It’s about training your brain to be able to think more and to try new things and have the confidence to become, uh, a leader in what you do. So really think about that as you practice and as you speak and get fluent faster. Well, let’s move into my kind of next tip for how you can improve your English this month, along with our winners of the Master English Conversation Scholarship Contest. Last month, I talked about how the getting fluent, uh, it’s kind of the same thing as starting a business. You can have many things right, but if you have a few things that are not right, then it can really, uh, destroy your confidence. It can really make it more difficult for you to get fluent, though it’s the same thing with any complicated skill, like starting a business, uh, or if you have, uh, many different things in some group or organization that you have to deal with. So I really want you to think about those things from last month. This month, what I’d really like you to do, so we, we kind of had you focused on one specific skill, this month I want to talk more about pronunciation and grammar and why it’s so important to focus on grammar more than pronunciation. So the next step in improving your fluency, as you work towards, you know, getting, again, we start from the very broad things, like thinking about your goal and now we are moving into more specific skills, like grammar and actually practicing your pronunciation. So what I’d like you to do first is just listen to a very quick reason why it’s much more important to work on your grammar before you work on your pronunciation. So you can always do that anytime, but I really want you to focus on your grammar. Now, when I’m talking with non-native speakers, I don’t really care about their pronunciation so much. As long as I can actually understand what they’re saying, it’s just fine. But usually, I can tell where people are coming from. Uh, and even for myself, as a speaker of Japanese, when I’m talking, people can tell that I’m, my pronunciation is really good, but it’s still not perfect. I’d like it to better so that if a Japanese person is closing their eyes, they can listen to me speaking and they actually think it’s a Japanese person. I’ve done that a few times and it feels really good when I can do that. I’ll be standing behind someone and I tell them, “Oh, can you please, uh, pass me something,” or do something like that and they turn around and they see a foreigner standing there and they’re like, “Oh, I, I thought you were Japanese.” And I, I get really excited about that. Anyway, when I’m either speaking Japanese or listening to other people that are speaking English and they have an accent, the thing that I listen more for is how they actually say words and if they’re grammatically correct or not. I don’t care about the pronunciation because people that are English speakers also have different pronunciations. So people coming from America, there are many different places in America and each one of us has our own pronunciation. Even people from Chicago, like myself, there are people from Chicago that are friends of mine. They are all born in the same place, but we all have different pitches. Some people have a, a very high voice like this and other people have a deep, low and interesting voice like that. People just have different kinds of voices. So even among English speakers, you still get a lot of variety as far as how people sound when they speak. But when you’re talking with non-native speakers or, again, when I’m speaking in Japanese, the thing that people are really listening for is whether or not your grammar is good. Now, you don’t have to be perfect, but the point is that if you make simple mistakes in your grammar, that’s really going to be much more obvious for somebody’s ears than it is if you sound a, a little bit different, kind of have a, a bad accent or something like that. So, again, the reason to focus on your grammar and not your pronunciation is because there are many different pronunciations of English around the world. And actually, now there are more non native English learners of English than there are native speakers. It’s just really that many people around the world, learning. And the kind of non-native English that people speak internationally – actually, I’ll tell you a very quick story. Uh, just a few days ago, I went to a traditional Japanese inn. This is [inaudible 30:00]. And at this [inaudible], I was talking with, uh, the owner. And he was explaining how, uh, because he can only speak, you know, a little bit of English, he can understand, but he has a much easier time speaking with other foreigners that are not native English speakers. So he had a, uh, a guest that came from, I think it was, uh, Amsterdam or something like that, uh, some European country. But the person, the guest, was not a native speaker of English. So this is where the, the non native English comes out where you have a Japanese person and, uh, you know, someone from Amsterdam or, you know, somebody from any other country that are using English, but neither of them is a non-native speaker. And he says that the, uh, English that he hears from people that are not native speakers is much easier to understand. And, you know, there are many good reasons for that. Mostly, people are not as confident in their English, uh, and they’re using more textbook language when they actually speak. So they don’t use idioms and slang and things like that. So, as a, a side note, kind of a different thing to think about for yourself, when you’re trying to figure out what kind of English you want to study, think about what it is you’re learning English for. If it’s for international business and you don’t really meet so many native English speakers when you’re actually working, but you still need to learn some English, then you can focus more on textbook learning because that’s probably what everybody else is doing. But, if you want to focus on improving your actual international English for, uh, going to, you know, England or Australia or Canada or even to the United States, then it’s really important to start learning that vocabulary. And, as long as you can understand what’s happening in the story and you know that, oh okay, now we’re talking about the present or, before, we were talking about the past, this is how you can take small differences in the things that you’re practicing and you focus on improving them yourself. So what I’d like you to do, in order to improve this month by focusing on grammar is to use kind of your own time traveling lesson. This is what we do with Master English Conversation. And still with Master English Conversation Version 2.0, we always have the grammar introduction where we, where we show something and try to make it incredibly simple, but then we take that story, that grammar and use it in different tenses. So what you can do personally to improve, uh, is to take anything you hear, like a story or a news report or anything like that, or even if it’s like a comment on Twitter, uh, or Facebook and you can actually repeat the same thing again, but just by changing the tense of the story. It’s such a, it’s such an important thing about basic grammar because, if you make basic grammar mistakes, uh, it sounds much more unprofessional as, uh, a person, especially if you’re in business and you have to use English for that. Uh, again, people won’t care about your pronunciation, as long as people are able to understand you. But if you really have bad grammar, and again, this is not really difficult grammar. This is more a very, very basic thing, uh, basic things, like, uh, you know, if I have like a pair of pants on or if I have one pant or something like that. 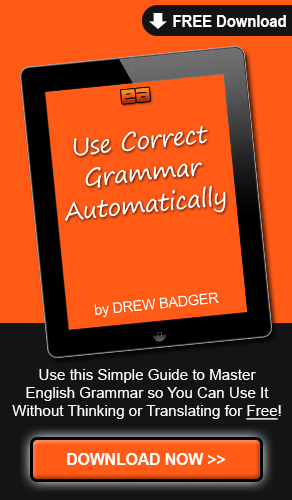 So there are lots of different things that you can work on, but really, focusing on these basic grammar exercises where you can do that yourself, uh, where you’re writing something or even if you’re just talking, uh, really take the time, at least once a day, to find something and then turn it into different tenses. If you don’t know something, you can go online and look. And again, it’s not about remembering the grammar rule. It’s just being able to use it over and over again, so it becomes a natural habit for you. That’s really the best way to learn. And I notice now, all of the phrases that I practiced many years ago for learning Japanese, now I just use them without thinking. And it’s basically just groups of words, and, uh, these are grammatical appoints also. But all of these things are basically just things that I practiced and I, I had to review, like, okay, I’m going there or I went there or something like that. And it’s just like any other skill that you have to build. It takes a little bit of time, but if you can have fun doing it and really enjoy, uh, the practicing and you have a strong goal, then you can really make, uh, make a good thing out of it and really find some success with practicing. So focus on your grammar. It doesn’t matter what you’re doing, whether you’re learning it for, uh, learning English at home because you’re just interested in doing it as a hobby or if you’re a, uh, you know, a business executive and you’re trying to figure out how to improve your, your business life and the things that you can do for that. Really think about those things because your grammar is going to be more important than anything else. Uh, if you can really speak with good grammar, I, I really can’t say this enough. It’s such an important point, but, uh, the grammar is going to give you more confidence and respect than pronunciation will. So don’t worry about pronunciation so much. You can worry about that in the later month. I’ll talk more about how to improve your pronunciation, but for right now, grammar. Well, I hope you enjoyed listening to this episode of the Power Learning Podcast. It was really great to listen to our four learners. I’m so proud of them. They’ve only been in the program for a few months and just think of the progress they will make after a full year. And I hope you decide to join them in Master English Conversation because, really, what, uh, what I’m trying to show and what they are showing, uh, is that anyone can it. Really, anyone can become fluent. It’s not a special thing that you need to have a, an amazing mind for. You don’t have to have a special gene or anything like that that, uh, maybe your parents were great speakers of languages and so you can too. It really just depends on what you want. For business or for pleasure, whatever reason you have for learning English, if you can think about what you want, you will become a much better speaker. Join us at EnglishAnyone.com. If you’re not already a member of Power Learning, I highly recommend you join this unique video course. And also, if you’re interested in improving your grammar and you really want to see grammar in action the smart way, I highly recommend you try Master English Conversation Version 2.0. You can learn more at EnglishAnyone.com and we will continue to improve this site and make things better with your help. So I hope you’ve enjoyed this episode. Have a fantastic day. Remember to keep listening, but also to get out and speak. You have to use your muscles in your mouth and then be able to practice your grammar as well if you want to become a fantastic speaker. Have an excellent day and I will see you next time. Bye bye.